Interview: Olof Morck of Amaranthe – Spotlight Report "The Best Entertainment Website in Oz"
We had the chance to have a brief chat with Olof Morck, the guitarist of Swedish heavy metal band Amaranthe. We chatted about their new record Helix, the addition to the band of their new singer Nils Molin, and when & if they might be heading to Australia for a tour. SR. You guys have your new album ‘Helix’ coming out soon, how are you feeling about that? Very excited! We started working on the album early this year, so it’s been about eight months in progress. It’s really cool to see all of the tracks come together, and to be able to release them to the public. We released the first single about three weeks ago, and the first group of journalists and publicists are starting to hear the album, it’s very exciting. SR. There’s a new music video for the track ‘365’ that you’ve released, are we going to be seeing any more music videos soon? Yes! We shot another video a couple of weeks ago. It should be released in early October, I was able to see the final product yesterday, which looked really cool. I can’t wait to share that with our fans. SR. Amaranthe has three lead singers, what’s the reason for this, and how does that work on stage? It was something that happened naturally when we first put the band together in 2008. It started with just one singer, and we invited a couple of other to do guest vocals. When we were listening to them, we realised that having the three singers add a lot of contrast and dynamic that really works. We thought we’d try it out as a permanent thing, and it’s been a vital part of the band since. I don’t consider it a gimmick or anything, because you can make it a promotion point that very few bands do this, but it’s more about having a wider variety in the music itself. It falls into place really nicely live, and on the records as well. There’s a stereotype of bands complaining about their lead singers, so you could think that with three of them, there may be issues. But that’s not the case at all, we’ve been very fortunate in that department so far. SR. How did you guys all meet? Elize and I had collaborated a fair bit, even before the first Amaranthe record. We met back in 2006 and collaborated on some songs together, and I helped her apply for Nightwish. It was during the process of writing a Dragonland record, and she found out they needed a singer, so we helped out to give her a bit of a boost, so she’d have a professional recording for her application. She was one of the top options for Nightwish, but unfortunately they thought she was a bit too young at the time. SR. Have you got a favourite track from the new record, ‘Helix’? My personal favourite at this point is the title track ‘Helix’. 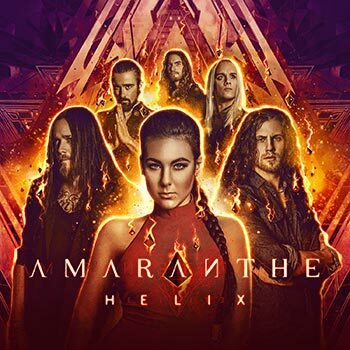 The song really encapsulates everything that Amaranthe is about, it has everything pertaining to our previous records, in terms of musical style. That song is almost like a summary of our entire career up to this point. SR. What have you done differently on this record, compared to previous releases? 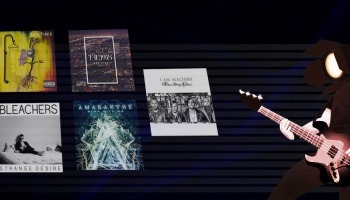 With previous records, we went a little more in depth with different elements. There was a lot of work with keyboards and vocal lines. I think this record is a little more complete, so to speak. We looked back over the bands previous releases, and decided to take certain elements from every album and put them all together, as well as introducing a lot of new things, to take it to the next level. It’s a very holistic album. SR. How did you meet your new singer, Nils Molin? We were playing a bunch of shows with their other band Dynasty back in 2012. Since then we’ve been in contact, and we found that we connected well musically. Since the release of Dynasty’s last record, we noticed that Nils’ vocal sounded very much like they would fit perfectly into Amaranthe’s music. It was so easy to imagine how good he would sound in Amaranthe, and it was around the time that Jake was getting really busy and having to sit out some of our tours. We realised that he may be drifting away from the band, so it was a natural starting point when it came looking for a new singer. Since he’s joined, he’s been a very natural part of the band, it feels like he’s been with us for years. When we asked him to try out for the band, he recorded ‘Invincible’, one of our tracks from a previous record, and when I heard him singing, it was very convincing, I could tell it would work. SR. You used to be called Avalanche, why did you decide to change the name to Amaranthe? It was a strange thing. We put up out first songs on Myspace about ten years ago under the name Avalanche, and we got heaps of positive feedback. We also got a cease and desist letter from a random guy up in North Sweden, demanding that we either pay him about fifty thousand dollars, or change our name, as he held the copyright for that name. We obviously didn’t have that kind of money, so we changed the name. Amaranthe was an idea for a song title, and we thought it sounded nice, and had a similar ring to it. It looks similar on paper, it has the same alliteration, and it has a cool meaning as well. Amaranthe comes from ancient Greek, and it means ‘something that doesn’t grow old or fade’, which we thought would really fit the music that we make, it’s young and energetic. SR. When do you think Amaranthe are going to be able to get over to Australia? I think that we’re aiming for next year, but nothing is set in stone yet. We’ve just started properly enquiring into an Australian tour, we’re really hoping for next year. 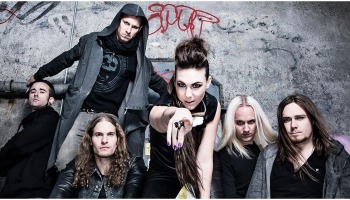 Follow Amaranthe on social media or via their website to keep up to date with everything that they’re doing. Keep an ear out for their new record Helix, which will be released very soon, and check out their music video for ‘365’. Give these guys some support, and we will be seeing them in Australia very soon!